An ocean cruise from, to or around Australia is still the most luxurious and comfortable way to explore this part of the world. 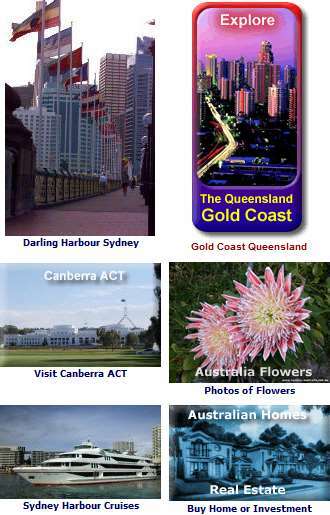 Most major cities in Australia are on the coast so they are all Ports of Call. Popular and becoming even more so are Australia cruises, giving you breathtaking views, exciting ports of call and a unique experience of this great and exciting country. You can even take cruise combo tours, where you can explore the Australian Outback as well as visit places along the coast in comfort. At the same time, it gives you an opportunity to get fit and/or relax, sample great food and entertainment, meet like minded people and just have a whole lotta fun. People of all ages are well catered for, whether just married, happily retired, single or the whole family. On most cruises to, from or around Australia and New Zealand, most meals if not all are included in the price, with free entertainment and activities. You can do it on a budget, in fact instead of doing the normal routine of staying in hotels, buying meals and travelling to various places, it can be a real alternative. Of course, you can also cruise in grand style. All the major cities in Australia except Canberra are on the coast. Again, there are a host of tours and activities that you can take to explore when on land. You can cuddle a koala, take an air or city sights tour, visit some great beaches, explore Sydney Harbour or find entertainment. In Sydney Australia with its grand harbour, for example, cruise ships dock at very convenient locations such as the Rocks or Darling Harbour. Within a few minutes walk, you can experience Australian history, world class museums, see Australian animals and sea life, or experience Aboriginal culture. Cunard’s Queen Mary 2 on its circumnavigating of Australia met up with a sister ship, the Queen Elizabeth for a Royal Rendezvous on Sydney Harbour on February 22, 2012. These grand ships always look spectacular on Sydney Harbour. We look forward to many more meetings like it. Royal Caribbean International has both the liner Radiance of the Seas and Rhapsody of the Seas with cruises to Australia, New Zealand and the islands. Stops include Sydney, Melbourne, Wellington, Christchurch, Tasmania and others. Holland America also has cruises of the South Pacific with wonderful ports of call, including Australia. Other liners operating in and around Australia include Princess Cruises, with the 77,000 tonne Sun Princess cruising with 20,000 passengers a year, while Silversea has the Silver Shadow visit Australian ports. POCruises.com: P&O has Pacific Dawn, based in Brisbane Cruise round trip from Brisbane with Pacific Dawn to the South Pacific or North Queensland, or from Sydney with the Pacific Jewel to Tropical North Queensland. Growing list of liners sailing to and from Sydney, Brisbane, Melbourne and Hobart. 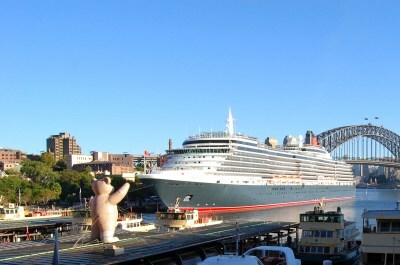 Popular with Australians is the Sydney to Brisbane Cruise, or vice versa. Further reading: Cruises: Destination Australia. The major cruise lines can arrange land excursions and usually offer a wide range of experiences for you to try. In Perth, virtually the same distance from Singapore as Sydney, you can explore the city center, Rottnest Island, Newcastle and the Swan Valley wine region. Melbourne has the Tasmanian connection, with regular car ferry services to Tasmania. see Melbourne Australia.